A Cut Above is North Oxford's premier Barber Shop. Now in our 25th year of trading in South Parade, Summertown, Oxford. 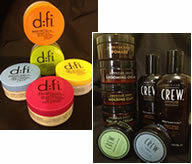 American Crew leads the way in men's grooming with both their classic and di:fi ranges.